The word ‘iconic’ has been over-used down the years, but if ever a caravan deserved the description, the Eriba does. Once built in France, the brand now belongs to Germany’s giant Hymer group. While much has changed in the industry, time seems to have stood still at Eriba. Despite a few tweaks, the basic design has been altered little in more than 50 years. 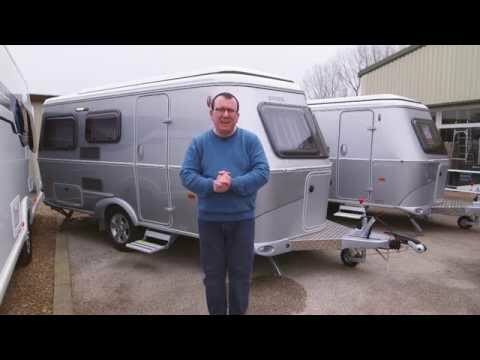 The pugnacious bullet shape resembles a scaled-down Airstream, particularly in its smart new silver hues. The roof still pops up and the inner framework is still made from tubular steel. It’s a breeze to tow and store, and the incredible build quality still slackens jaws. Your jaw will drop when you see the asking price, too, but this kind of build quality isn’t cheap. The Eriba is less than 5.8m long, which makes getting it inch-perfect on a pitch simplicity itself. Still, its tubular-steel frame adds heft; fully laden, you’ll be tipping the weighbridge at 1300kg. The good news is that the payload is a useful 360kg. The Eriba Touring is impressive across the board. The corner steady winding bolts are easy to see and operate, while the hitch has an Al-Ko stabiliser. The toilet hatch is banished to the offside wall, as is the hook-up point. Eribas have dinky inboard water tanks: there are no potentially messy exterior filling points. Most impressive of all, however, is the giant front gas locker. It is gloriously over-engineered and the door rises majestically on a pair of gas struts to reveal room aplenty for cylinders and odd camping bits. It’s also good to see the fitted manual fold-out step. Release four T-bar catches and push on the ceiling to pop the top and get ample headroom and the benefit of campervan-style roof curtains in the Eriba. The opening nets allow light and fresh air in, but keep bugs at bay. Beware, though: the elevating roof covers 80% of the caravan’s length, and stops at the forward end of the large rear dinette. You may bump your head on the lower bulkhead several times before you remember to duck. The dinettes are surprisingly accommodating and comfy. The rear is the entertaining and dining hub, while its simple settees look like stylish refugees from a classic 1950s saloon car. All three windows here get fitted net curtains. By night, there are two stylish L-shaped corner lights, a pair of adjustable lights and a central roof light, all touch-operated. The table is a good size and fitted with a ‘kneeling’ leg support, which hints at its role as the bed base. The rear of the dinette looks as if it ought to have additional curved backrests, but it receives only a couple of scatter cushions. This compromises feet-up lounging potential. The front dinette is much smaller, and the occupant of the nearside seat may feel hemmed-in by the washroom’s exterior wall. However, the trademark front bay windows open up the space. We like the deep bulkhead storage bins and additional power point here, too. You’d imagine the Troll 530’s kitchen would be poky and cheerless, but it’s pretty good. Worktop is short, despite the extension flap by the door, and there’s no room for a full cooker. But the 70-litre Dometic fridge is charmingly retro and boasts a built-in freezer box. Storage space is surprisingly good, with large, uncluttered roof lockers, a huge cutlery drawer and low storage space. The Eriba’s washroom was never going to be spacious, but its designers packed in an awful lot. The bench toilet has ample space around it, the basin’s tap doubles as the shower riser and the shower tray is a good size. Storage options abound, including behind the vanity mirror. The Eriba Touring Troll 530 can sleep three people; the front dinette is likely to be reserved for a junior member of the family. Making up each bed is a bit fiddly and involves fitted metal poles and hard-bottomed seat cushions. It’s in keeping with the retro-chic that devotees demand, but pull-out slats would be easier to use. The rear double bed is 1.98m long and 1.4m side, while the front bed is 1.98m long and 0.93m wide. The interior is encircled by roof lockers that are free from clutter and fitted with positive catches. There’s plenty of storage space beneath the seats, and the nearside rear can be accessed from the outside. The wardrobe impresses with its generous size, ample hanging space and quartet of large, deep shelves. Bizarrely, an additional power point is hidden at the top. Low storage in the Eriba caravan's kitchen and washroom isn’t as generous as it first appears, due to two inboard fresh-water tanks, but there’s additional stowage space in the forward bulkhead pods. You either ‘get’ the Eriba Touring range or you don’t. If you don’t, chances are you’re put off by the price and the perceived lack of interior room. If you do, you’re likely to be a fan of the unusual looks, exceptional build quality and the quirky little space-enhancing design touches. Either way, Hymer's Eriba is one caravan icon that’s going to endure.